This entry was posted in Absorption, Alabama Coast, Baldwin, Home values, Monthly comments, real estate and tagged Alabama, Alabama Coast, Baldwin County, Days on market, Inventory, July, Monthly comments, Moving average, Real estate pricing on August 13, 2013 by Tom Brander. Sales in April improved 10% to $189,845,478 from March’s $172,627,863, up 20% from last April’s $158,607,279. The 12 month moving average line for total dollar sales has tilted upward nicely. Unit sales were up 5% to 1,175 in April from 1,123 in March, an increase of 52. This is up 15% from April 2011 at 1,026. This is 7% unfavorable to our projection of 1,264 sales expected for April and 9% unfavorable year to date. The complete monthly projections from ABRE (a joint project between ACRE and Brander Real Estate) can be found here http://goo.gl/WFHrO along with the worksheets that show the methodology. It appears that the results are closing in on projections as the spring unfolds. New sales declined 4% to 108 homes this month from 113 in March, a decrease of 5 units. Used sales improved 6% to 1,067 homes in April from 1,010 last month, an increase of 57 (Sect E p.3). This month total inventory is dramatically lower at 10,177 vs. 12,884 last year and 10,627 last month. The drop in the current month is caused by month-end expirations which should come back on the market shortly. Still, there is less of a seasonal increase in listings than last year. Active New listings decreased to 774 in April from 1,108 in March, a decline of 334 units (Sect E p.3). Housing permits went up for Jefferson county to 120 for March up from 95 for February. (see website for details). Absorption for Used homes in April shows 10 months, four months better than 14 months last year. Used Active listings at 9,403 are lower than the 11,761 last year (Sect E p.3), (Sect E p.3). Birmingham area Average Days on Market for New houses was 233 compared to last month at 194 . The Used homes DOM was 136 in April, compared with 146 last month (Sect A p.18). NOTE: DOM for Used Homes indicates that well priced homes are moving in less than 6 months. The high months of inventory indicates that sellers, including bank owners, are still holding out for higher prices. Again: If the home is not selling, reduce the price, particularly since we are in the most active sales season of the year. Average sales price for Sold New homes decreased to $228,311 from $237,235 last month (Sect A p2). Average sales prices for Sold Used homes increased to $154,525 from $144,377 last month (Sect A p2). The twelve month moving average price line for Used Homes has been quite steady since mid 2009. Average Home prices, new and used, have stabilized (Sect A p2). The price of any specific home still remains under pressure. This entry was posted in Birmingham, Building Permit, Forecast, MLS, Monthly comments, real estate, sales forecast, sales projections, Shelby County and tagged April, Birmingham, building permits, Days on market, Monthly comments, Moving average, Price, Real estate pricing, Sales on May 26, 2012 by Tom Brander. Unit sales were down 22% to 753 in January from 963 in December, a decrease of 210. This is a 10% improvement from January 2010 at 684. This is 5% unfavorable to our preliminary projection of 792 sales expected for January. This error will be less as late sales are reported next month. 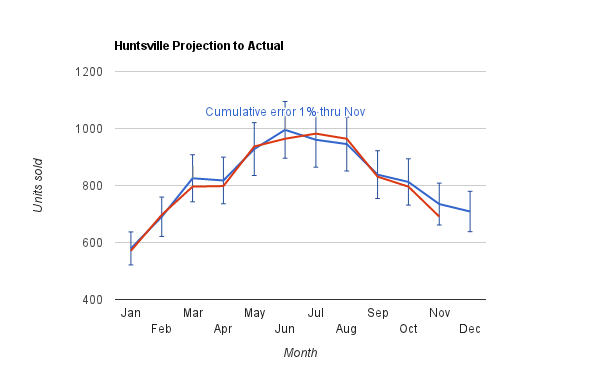 Our full year projections will be revised when the final January 2012 unemployment rate is released in late March. New sales declined 37% to 82 homes this month from 130 in December, a decrease of 48 units. Used sales declined 19% to 671 homes in January from 833 last month, a decrease of 162 (Sect E p.3). This month total inventory is dramatically lower at 9,812 vs. 12,183 last year and 10,414 last month. The significant drop in the current month is caused by month-end expirations which should come back on the market shortly. Active New listings decreased to 829 in January from 1,073 in December, a decline of 244 units (Sect E p.3).Housingpermits showed a decrease in Jefferson County to 64 in December from 77 in November. Shelby County was down to 6 from 19 (see website for details). This entry was posted in Absorption, Alabama, Birmingham, Building Permit, Forecast, Home values, Jefferson County, MLS, Monthly comments, real estate and tagged Absorption, Birmingham, Days on market, December, January, Moving average, Price, Sales on February 12, 2012 by Tom Brander.